Simple Succulent Wreath - Lovely Etc. Even though we are supposed to be hit with a snow storm later today, I have definitely got spring on my mind. 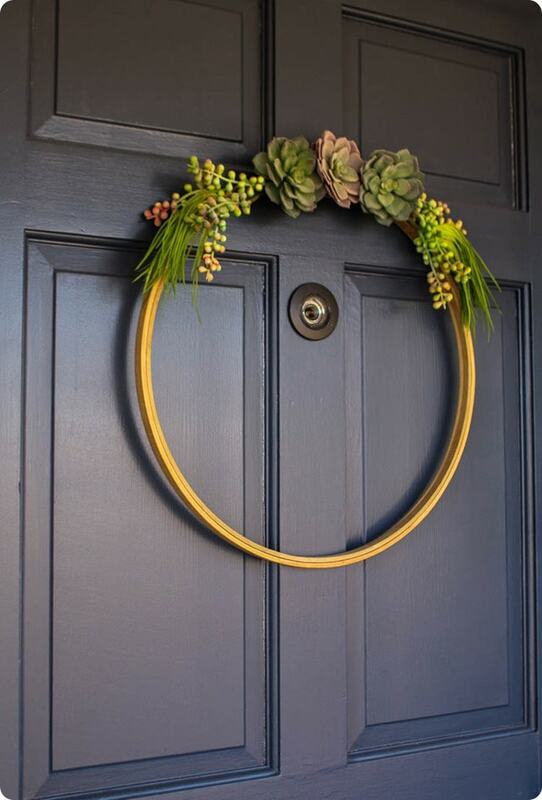 And my first spring project of the year is this super simple succulent wreath. I’ve shared before that I adore succulents, but I’m not actually all that good at keeping them alive. 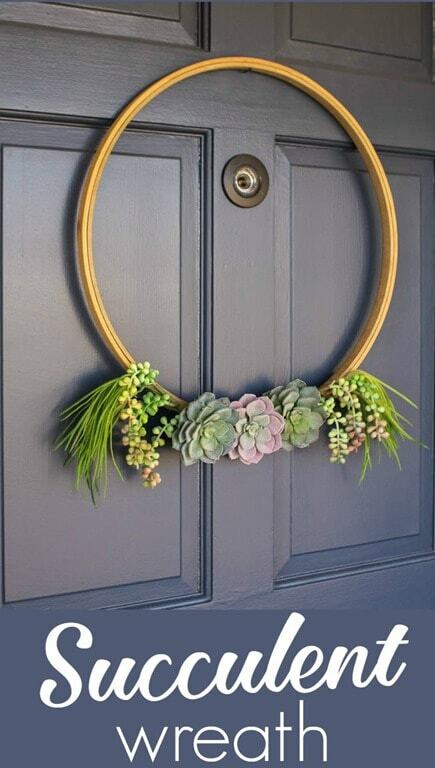 Luckily this cute wreath uses faux succulents so no live plants had to be sacrificed in its creation. (Though I have made it a goal to learn to take better care of plants this year.) Even better, this project took less than 20 minutes to do which is always awesome. In fact I’m pretty sure I spent more time in the aisles of Michael’s trying to choose the perfect faux succulents to buy than I did actually putting my wreath together! This post contains affiliate links; see my full disclosure here. Ok, this is seriously ridiculously easy. First lay your flowers out on your embroidery hoop until you find a basic arrangement you like. 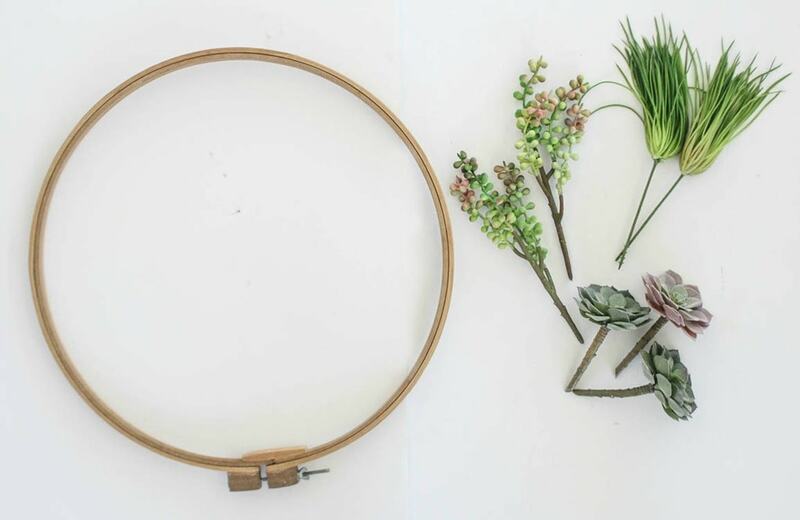 Use floral wire to attach long stems to each side of the wreath form. 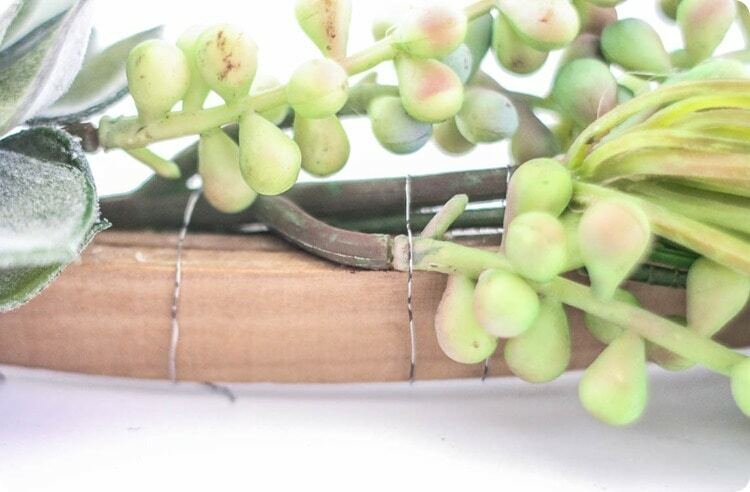 Remove the stems from the larger round succulents. These usually pop right off. Then use hot glue to attach the succulents to the center of the wreath. That’s it! 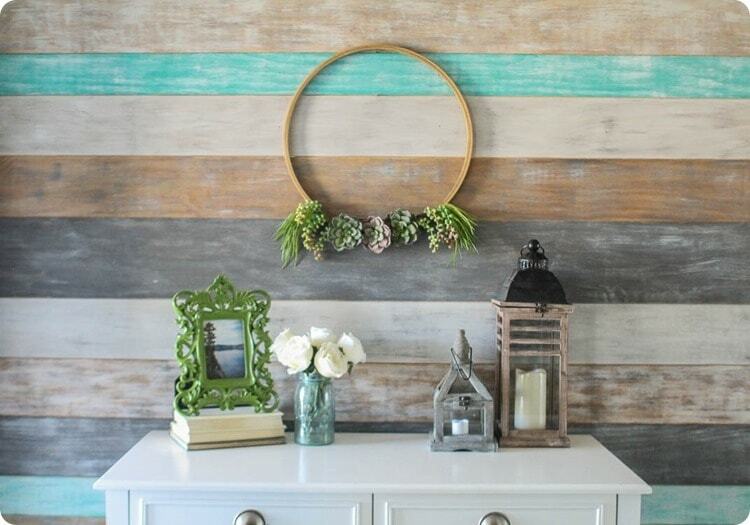 I had to try it out in both of my favorite wreath spots: our front door and the plank wall in my entry. Here’s the funny thing about this wreath. When I made it, I intended for the plants to be at the bottom of the wreath. I do really like it that way. But on a whim, I decided to flip it around and try them out at the top…and now I’m kind of thinking I may like it that way even better! So here’s the question: which do you prefer, flowers at the top or the bottom? Super easy and elegant, rite? This reminds me somewhere in Phuket-Thailand. Thank you for sharing this projet, Carrie! I love it and my favorite is the plants on the top. Thanks for weighing in Lin! Thanks Melody! I actually wanted to it to be more angled originally, but I couldn’t get it to hang right because of the weight of the succulents. I may have to play around with it a bit more. I love it on top! Looks great! Succulents on the bottom gets my vote, perhaps add a pretty bow (burlap, deco mesh, anything textured} on the bottom? Love all the great ideas on your blog, Carrie! It’s a hard decision, Carrie, but I think I like it better on top. This is probably just me, tho, because I just don’t care for the open circle on top. However it is VERY attractive both ways. Maybe you need two of them. By-the-way, I’d love to know what part of VA that you live in. My home is in Hampton (Tidewater area) and I understand this has been quite a warm winter there. I have been in SW Florida for the past ten years, and this is the coldest winter I have known here (after the hottest summer!) Been in the 40’s the past two nights!! Thanks Michelle, I think you are probably right – the top looks a bit too bare with everything at the bottom. I am in SW VA – it has been a pretty warm winter overall here, but the weather seems to change every couple of days from cold to warm and back! Hard to get used to. Florida sounds nice right now! The arrangement on the top has the best balance. Striking yet simplistic. 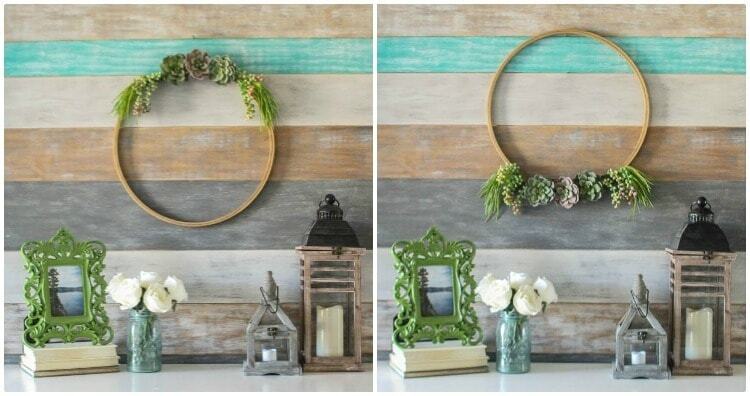 Top on inside wall, bottom on the door would be the way I would hang them. Both are pretty! The dilemma for me would be, where to hang it lol! Thanks Ren! You are right that it looks so different in the two spots! I’m not sure where it will end up! Very pretty! I vote for flowers on the top! Great post! 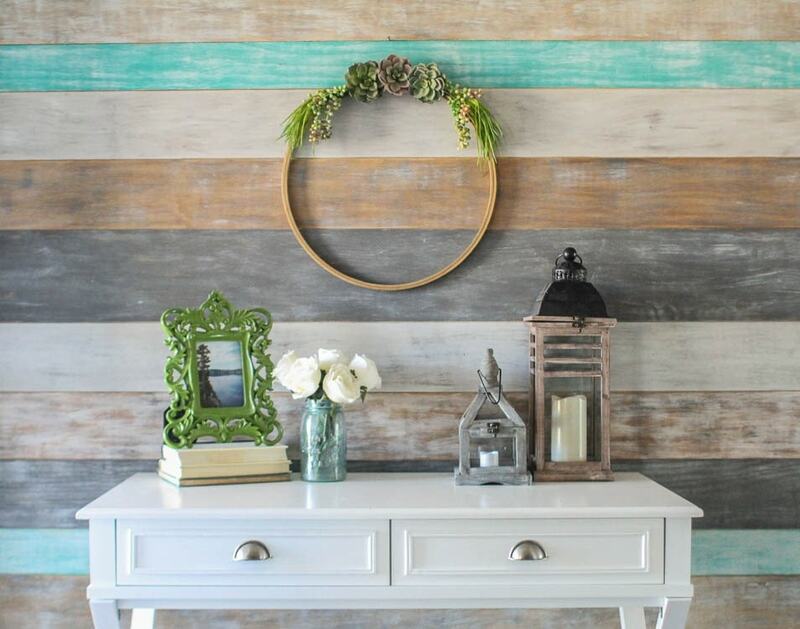 Thank you for sharing; I’m making one this week! Question…how did you get it to stay on the front door without it falling off every time it’s opened and closed? Seems like it would slip right off the nail? Great question Lisa! When I first hung it on the door it definitely did fall right off whenever it was closed a little too hard. A little velcro command strip under the flower part took care of it.